This is a sad story. Unfortunately, its an all to common occurrence. Recently a friend was in charge of snacks at her church’s Vacation Bible School. The theme was Greece and she wanted to bring in healthy food options like hummus, pita, carrots, olives, etc. 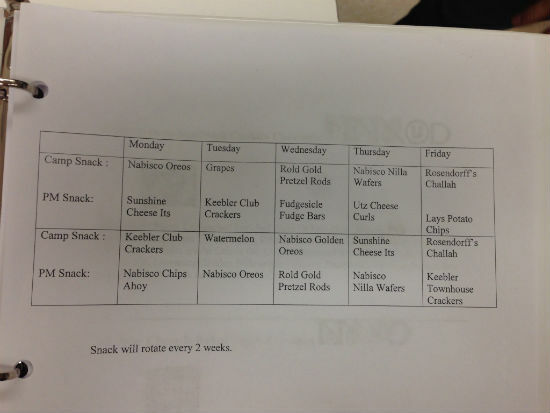 The VBS director objected that no one would eat “those snacks” and wanted her to use manufactured, store bought items. My friend still brought in the healthier snacks and many of the children loved them. It really starts with one person to begin the change. When enough single voices are heard, it can be thunderous. How awesome of your friend to stick with her convictions!!! I think sometimes we adults are the problem–not the children!! For me, summer camp was a special treat. I have no idea what we ate. I only remember camp-out s’mores. But since it was a special treat, junk food was totally allowed. My mom was always very healthy snack conscious at home. We were the only kids that ever packed giant granny smith apples and whole grain breads in our lunch boxes. My mom never allowed sugary cereal and instead of chips it was always nuts or pretzels. I am much the same way. But at a sleepover? I hope my kid eats 42 slices of junky take-out pizza (the stuff we never ever have at home) and a humongo ice cream sundae. I hope he has melty delicious s’mores to his heart’s content at summer camp. I hope he eats Oreos. Because camp is a treat. And in moderation none of it is gonna kill you. If my kids were at camp 5 days a week for a whole summer I’d probably be sending them apples and carrots all the way. But for just one week? Let it be full of junk. Detox later. Thanks for your comments! I’m not sure the author was saying all food needs to be super healthy at camp–rather, she was making the point that if she wants to send a healthy snack for her daughter, couldn’t they just give her the healthy snack without making her an obvious source of drama? If “inclusiveness” and “belonging” are the camp missions, then they blew a really nice learning opportunity. The camp nurse is who you see if you’re throwing up. Or need your Ritalin. Baby carrots don’t seem to fit that level of medical need to me, but then I have never been a “camp nurse” so I have no idea what is in their job description. What bothers me most about the camp’s response is that it sets up a pretty lousy scenario for the child, who is now caught in the middle of her family’s values about food and the camp’s expectations about what is “normal” eating. She is 5 and she has to choose between disappointing her mom and looking like an oddball to her peers. A nicer way to approach it might have been to tell the mom that while the snack schedule is set, she is welcome to send her daughter with a healthy snack that she can eat with all the other children, but that she is welcome to have the provided snack if she chooses. The school nurse bit was unnecessary and (I am making a judgement here based on my own experience with the school system) possibly a bit retaliatory against the parent. Hard to know since we only get one side from the article, but bucking the system is one sure way to get talked about as a parent. I think you should have written the article. Tx! You bring up some GREAT points–we can’t be so consumed with food control that we leave the fun out of life. And I will rationalize S’mores til the end of time 🙂 Hope this week is better for you all–still thinking of you.